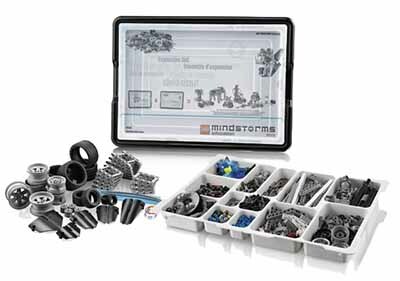 This set contains a wide range of elements and is an ideal supplement to the EV3 Core Set. It has been designed to allow students to take their experience of robotics to the next level; build an elephant, a stair-climbing robot or a spinning factory! There are plenty of special elements, such as different gears, a large turntable, robot personalization parts and unique structural elements. These are joined by many extra standard elements like beams, axles and connectors. The set is optimized for use in the classroom and after school programs or robotics competitions. Additional building instructions and programs for several models can be downloaded from LEGOeducation.com/MINDSTORMS.